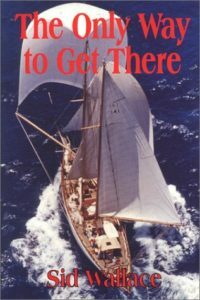 After a successful career which began as an apprentice meat cutter in the Depression years and culminated in his owning his own chain of supermarkets, Sid Wallace retired at the age of 42 and began an exciting and even more active ‘career’: Captain of his own sailboat, the Constellation, a 102 ft, two-masted schooner. Since his teenage years, he had dreamed of visiting exotic lands. “The only way to get there” in 1966 was to go in a private boat -there were no cruise ships or landing fields for aircraft-so in order to see the wonders of Easter Island, the amazing animals of Galapagos, or the mutineer-settled world of Pitcairn, Sid and his wife, Irene, had to buy and outfit their own boat. On the Connie, as she was affectionately nicknamed, Captain Sid and his crew sailed to Mexico, the Galapagos Islands, Pitcairn, and Hawaii, with many ports in between. During their voyage, they encountered fire on board ship, mountainous waves, a chilling mystery on Floreana Island, a film crew who shot a commercial on board the Connie, and a near-shootout between the FBI and one of the “ten most wanted,” who happened to be on a boat docked next to the Constellation! Of deep and lasting value were the friendships forged among the crew members, and with the inhabitants of the Connie’s ports of call. From saving the life of a young mother in Mexico, to assisting a young shipwrecked honeymoon couple from France, the captain and crew of the Connie were always ready to help out. There were barbecues, luaus, and fiestas, as well, and encounters with fascinating characters on this unforgettable voyage of discovery and adventure.